UPSC civil services prelims admit card 2018 issued, download it now: The Union Public Service Commission (UPSC) issued the admit card for Civil Services Preliminary Examination 2018 to be held on June 3 on its official website www.upsc.gov.in. Candidates will not be issued a physical copy of their admit card, which can be downloaded from the UPSC website. Candidates must download it on their computer and take a printout, which must be carried to the exam centre. In case the photograph is not clear, blurred or not available on the e-admit card, candidates will have to carry two identical photographs for each session to the exam centre along with a proof of identity like Aadhaar card, driving licence, passport or voter ID card with an undertaking that the proof is genuine. 1. Check the e Admit Card carefully and bring discrepancies, if any, to the notice of UPSC immediately. 2. Mention your Name, Roll Number, Registration ID and Name & Year of the Examination in all the correspondence with the UPSC. 3. Bring the e-Admit Card in each session to secure admission to Examination Venue. 4. You are responsible for safe custody of the e Admit Card and in the event of any other person using this e Admit Card, the onus lies on you to prove that you have not used the service of any impersonator. 5. Candidates should note that any omission/ mistake/ discrepancy in encoding / filling in details in the OMR answer sheet, especially with regard to Roll Number and Test Booklet Series Code, will render the answer sheet liable for rejection. 6. Please note that entry into the Examination Venue shall be closed 10 minutes before the scheduled commencement of the Examination i.e. 09:20 AM for the Forenoon Session and 02:20 PM for the Afternoon Session. No candidate shall be allowed the entry into the Examination Venue after closure of the entry. 7. Candidates are advised to enter the Examination Venue well in time for frisking. 8. Candidates should note that they shall not be allowed to appear at any other Examination Venue except the Examination Venue mentioned in the e-Admit Card. 9. Read the 'Special Instructions for candidates admitted to the Examination' given in the 'Rules for the Examination' available in Examination Notice and the 'Poster' containing instructions displayed outside the Examination Venue. 11. Candidate should not be in possession of or using any mobile phone (even in switched off mode), pager or any electronic equipment or programmable device or storage media like pen drive, smart watches, etc., or camera or Bluetooth devices or any other equipment or related accessories either in working or switched off mode capable of being used as a communication device during the examination. Any infringement of these instructions shall entail disciplinary action including ban from future Examinations. 14. Candidates are advised not to bring any valuables/ costly items and bags to the Examination Venue, as safe keeping of the same cannot be assured. The Commission will not be responsible for any loss in this regard. 15. Candidates who do not have clear photographs on the e-Admit Card will have to bring a photo identify proof viz. Aadhaar Card, Driving License, Passport, Voter ID Card, etc. and two passport size photographs one for each Session for appearing in the Examination with an undertaking. 16. Orthopedically / Visually Impaired candidates, who have opted for their own scribe, may note that their own scribe will be allowed for the Examination only with a separate e Admit Card for such scribe. The e Admit Cards for the own scribes will be issued separately. 17. Candidates belonging to Persons with Benchmark Disability (only blindness and low vision sub category) should not attempt such questions in Paper II, where data interpretation (charts, graphs, tables, data sufficiency, etc.,) is required. Questions numbers of such questions are highlighted in the Paper II [e.g. if Question No.1 is highlighted question, it would look like ]. Marks of these questions will be distributed equally amongst the remaining questions for such candidates. 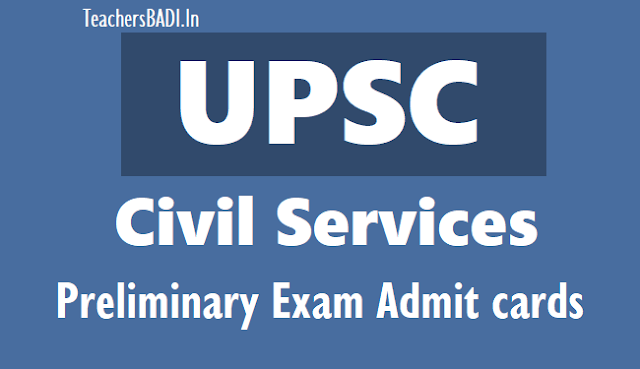 Candidates should report any discrepancy in the e-admit card to the commission immediately by email at uscsp-upsc@nic.in. Entry to the exam venue will be closed 10 minutes before the commencement of the exam and candidates will not be allowed after 9:20am for the morning session and after 2:20pm for the afternoon session. “No candidate shall be allowed entry into the examination venue after the closure of entry,” the commission said in a statement. It added that candidates would not be allowed to sit for the exam at any other test venue than the one mentioned on their e-admit card. Candidates should carry black-inked ballpoint pens as they would be “required to fill the OMR [optical mark recognition] answer sheets and attendance list with a black ballpoint pen only”. Candidates may submit representations, if any, on questions asked in the preliminary examination papers to the commission only through the “Online Question Paper Representation Portal (QPRep)” by accessing http://upsconline.nic.in/miscellaneous/QPRep/ from June 4 to June 10. “No representation through any other mode and after June 10, 2018, shall be accepted by the commission,” the statement said. Candidates cannot carry mobile phones, pagers or any electronic equipment or programmable device or storage media such as a pen drive, smart watches, etc or camera or Bluetooth devices or any other equipment or related accessories either in a working or switched off mode capable of being used as a communication device. Calculators are also banned inside the examination hall. “Any infringement of these instructions shall entail disciplinary action against the concerned candidates including debarment from future examination/selection,” it said. Valuable items and bags will not be allowed inside the exam venue.